When done well, stage plays have the power to transport their audiences to places abroad, invoke concern and impact the lives of the people both on and off stage. This year’s Jhalak performance checked off all those boxes and more. Jhalak is an annual Spring event that showcases an original play, written and directed by members of Emory’s Pakistani Students Association (PSA). Every year, PSA chooses a different ongoing political issue in Pakistan to focus on. This year’s play used a comedic family drama to address the Pakistani water crisis. Proceeds from this year’s ticket sales went to the Aga Khan Development Network Water and Sanitation Extension Program, which “establishes projects to improve water and sanitation conditions,” according to the Jhalak pamphlet. The play follows the experiences of Khalid Dhanani (Farhan Tejani, 21C), the dashing, compassionate eldest son of a large, lower-income family living in Karachi, Pakistan. Khalid is beloved by his family members and strives to financially support them. But government corruption and water scarcity has made it difficult for the Dhanani family, like families all over Pakistan, to acquire clean drinking water. Lack of access to clean water obstructs routine tasks in the lives of Khalid’s family. For example, Khalid’s father contracts Hepatitis A, a water-borne illness, and becomes unable to work. Meanwhile, Nadia Khan (Mina Farooqi, 22C), an intelligent and beautiful girl from Islamabad, Pakistan, moves with her family to Karachi. Her father, Ghulam (Arjun Pandya, 19B) is the president of the Karachi Water and Sewerage Board (KWSB). While he is a kind-hearted man and major Drake fan who gives Nadia an internship at KWSB, his family’s wealth ultimately hinders his ability to fully comprehend the complexities of the water crisis, which he blames entirely on mafia “thugs.” KWSB’s efforts to infiltrate the mafia are thwarted by Anum Ali (Shabih), his right-hand lady who, in a twist, also happens to be Scar, the water mafia leader. Say the name “Anum Ali” out loud and you’ll notice one of the various clever clues and cues woven into this year’s Jhalak performance (hint: anomaly). While it may have been easy to have inauthentic, two-dimensional villains and simplistic problems in the two-hour play, PSA members collectively created a piece of art that reflected a real issue. That is why it worked. It argued that, if people in power are competent and compassionate, those affected by structural violence will not have to resort to lives of crime to simply survive. The double-agent twist certainly infused comedic conflict into the play, but the central conflict and comedy revolve around Khalid and Nadia’s kiddish romance, which innocently begins in a Kulfi shop before either of them become aware of the other’s identities. “Jhalak 2019: A Glimpse of Pakistan” effectively humanized those on every side of the water crisis issue. By infusing likable and dynamic characters of different opinions into the play, Jhalak holistically examined and presented multiple angles of the issue. Therefore, audience members received the opportunity to mull over the complexity of a real-world problem alongside fictional members of the Karachi community, who did the same on stage. While the performance certainly tackled big political issues, it also made room for laughter. Raheem (Muhammad Dhanani, 21B), a fellow mafia member, had a particularly enchanting and goofy stage presence. Dhanani’s slight side steps, pivots and gestures sent the audience into dizzying, uproarious laughter. Pandya and Vikram Sivakumar (22C), who respectively played Nadia’s father and younger brother, also worked the crowd with clever lines and Urdu quips. The moments that characters shared after prayer in the Masjid and at the dinner table were shrouded in a cultural specificity and warmth that enriched the play as well. During set changes, the stage faded to black and popular Hindi and Urdu songs pooled throughout the auditorium. 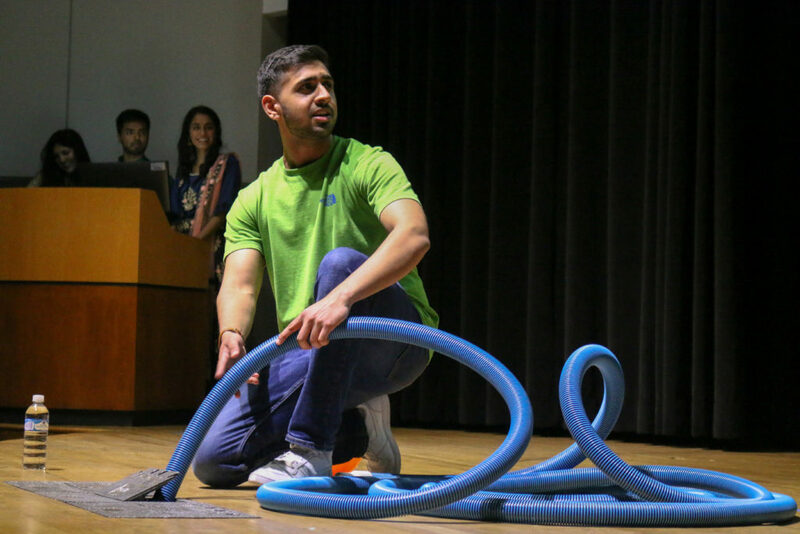 Jhalak was spliced scenes with songs from Bollywood movies like “Kuch Kuch Hota Hai” and “Kal Ho Naa Ho.” These musical selections tethered the play together and drew swaying and humming from Emory students, family of PSA members and everyone in between. As I stepped into White Hall and saw seas of exuberant, gorgeously adorned people, I already knew that I was in for a treat. But I did not anticipate walking away as hopeful and cheery as I did. If you have yet to experience Jhalak I highly encourage you to participate in the Spring of 2020. You will not regret it.